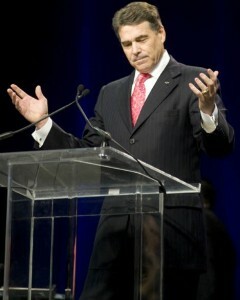 Rick Perry’s Day of Prayer – What Message Did It Give? Recently, Gov. Rick Perry, R – Texas, hosted a day of fasting and prayer in my hometown of Houston. The governor asked those in attendance to pray for America and her leaders. I am a less than silent supporter of President Barack Obama however, lately, I have become disappointed in his and the other elected officials’ inability to govern this country effectively. The Oval Office, Congress and Senate are beginning to resemble one big schoolyard with bullies on each side playing Dodgeball with bricks and waiting for the other side to “blink first”. I am an unabashed proponent of praying. Praying for our leaders can never hurt but only help them to thoughtfully, selflessly and wisely author and pass laws that add to the well-being of America and the world. I fully supported Perry in this endeavor, but I am not naïve. I understand his day of prayer was inspired by his interest in pursuing a run for the presidency. However, I would never doubt Perry’s sincerity. I’d like to believe it was a mostly genuine effort. As with anything that mixes religion and politics, there was controversy. Picketers protested the event. There were, of course, the atheists. There were those who strongly believe in separation of church and state. There was also a young man representing the GLBT community. I remember him because he said something that stuck with me. When interviewed by a local news reporter he cited one of the reasons why he was protesting was that he didn’t think those in attendance would accept him. I can’t pretend that there aren’t judgmental Christians or that there haven’t been many who have used the Word to further their own selfish agendas. Jesus addressed these types of individuals in Matthew 23. Men are imperfect; that is why our faith should never be placed in man but only in God. “I will say of the Lord, ‘He is my Refuge and my Fortress, my God, in whom I trust.’” Ps 91:2, NIV. That is something all Christians should remember, whether it’s facing our own difficult circumstances or standing up for what is right in the sight of the Lord. Let’s work on our attitudes to prevent people like the young protestor from feeling as if Christianity is out of their grasps. Remember, our job is to bring people closer to God, not push them away.